My fortune for the day. Obviously true. I never used to put much stock in those white slips of paper from my fortune cookies. Now, I’ve always liked those oddly tasteful fortune cookies but found the fortunes inside to just be a humorous read. But today’s fortune was just so accurate. I mean, just read it. It’s obviously true and meant for me. And now I am a believer. This morning I had a meeting with the project owner and a subcontractor to negotiate a major difference of opinion in the contract language. It was a meeting where my boss simply told me “Go fix the problem”. With a statement like that, I had all the rope I needed to metaphorically hang myself. So off I went this morning, expecting the worst and hoping for the best. The worst was a lawsuit with attorneys and a huge delay on my project which would cost me thousands of dollars. The best was me persuading my subcontractor to proceed with work tomorrow at no additional cost. I’m good, but not perfect. However, I was lucky enough to get work to start Friday without any major cost increases. To celebrate my success and of course lunchtime, I met up with a friend at OB Noodle House – one of my favorite restaurants in San Diego. It was there that I became a believer in the fortune cookies. It wasn’t hard to believe what I read, because it was a simple summary of me. 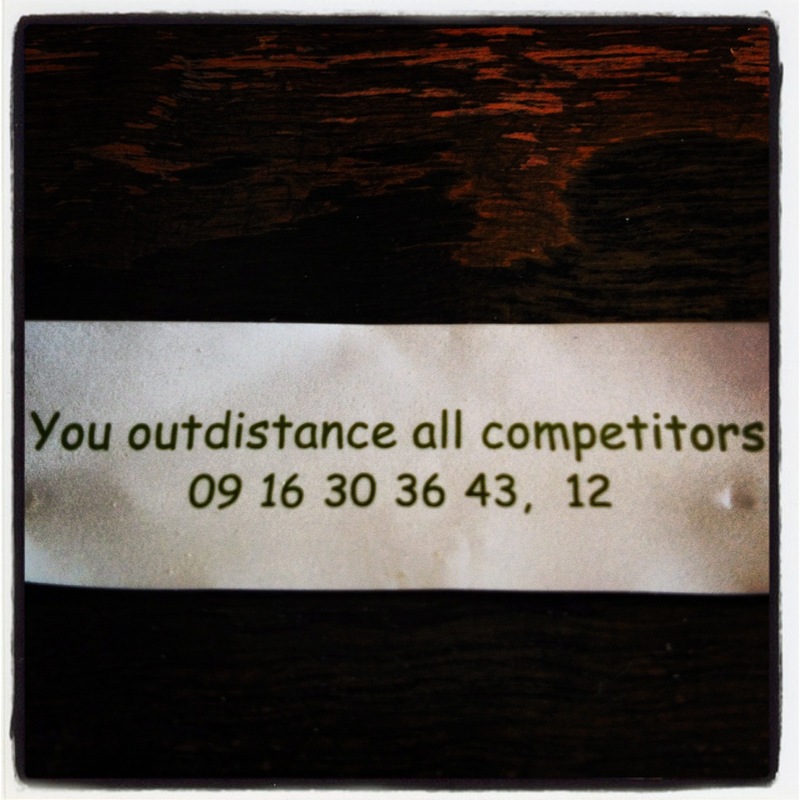 “You outdistance all competitors”. It’s kinda hard to have a better day or fortune than that.